Autodesk has created an interactive set of tools to help you design your infrastructure and civil projects by incorporating every part of the design process so that you are communicating accurate, realistic presentations to project stakeholders that may have little or no experience with engineering drawings. Of course, this is only one reason the Infrastructure Design Suite will help you stay ahead and we have many more. Join us this Friday, January 18 at 11 am for a free, live webcast. Kevin Spear, Synergis Solution Engineer will focus on visualization for preliminary and final designs. In the Infrastructure Design Suite Premium and Ultimate, he will utilize the applications AutoCAD Civil 3D and 3ds Max Design. At first sight, these two applications may seem worlds (or industries) apart, however, Kevin will explore the workflows provided in the Suite that will give cinematic quality to your designs, while syncing with the design software so any changes are corrected in the visualization as well. He will also show how easy it is to bring in Revit models to accurately convey site plans. 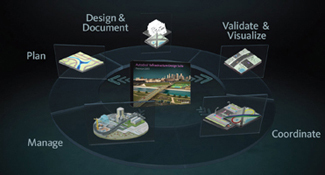 Autodesk infrastructure Design Suite: Design with the entire organization in mind. • Plan — Access and integrate CAD and GIS data for analysis and more informed decision making. Too see how the suite addresses this, see Kevin’s recorded webcast: Infrastructure Modeler: Create. Evaluate. Communicate. • Design & Document — Explore more design options, analyze project performance, and deliver more coordinated documentation. This is where your AutoCAD & Civil 3D comes in. If you need help here, you can attend training, see our training courses for essentials through advanced design. • Validate & Visualize — Create renderings and animation to help validate designs, communicate design intent and create compelling presentations. If you want to see this, register for the current live webcast Friday. • Coordinate — Integrate models from multiple sources for project review and construction sequencing. We will cover some of this workflow as well in this live webcast.